Needed complete brake job done. Very competent crew. In and out of this busy shop in about five hours. They cover all things automotive. Garage is a little out of the way on Poseyville Rd. but we’ll worth the trip. They also have a drop off and pick up service so you are not stranded in Bullock Creek. -Sean B. My boyfriend has been taking his car here for quite some time. I started having issues with my car so I took it here and they diagnosed the problem right away and fixed my car the same day. Very nice, genuine people that take time in explaining What s wrong so that a girl can understand! The next day my boyfriend went to see if they could drive his car a bit since it was making some weird noises and of course they found the problem out right away and fixed it! Both of us are beyond happy with the service we received from everyone there!!! A trustworthy business that’s very hard to find now a days!!! Thank you to everyone at the shop for your help!!! -Jennifer S.
I think the thing that makes them standout to me is that they don’t treat me like “a dumb girl.” They explain things to me and never take advantage of the fact that I may not know or understand! They are honest and I trust them with my life, because I trust them with my car! -Sara G.
They did a great job getting me in fast and had excellent communication with what was going on with my vehicle through diagnostic and repair. I appreciated the fact that they were upfront with costs and consistent with price as quoted. I will be coming back for future repairs. -Jose G.
Just moved to Midland. Was dreading finding a new auto shop. Search over! Came highly recommended and I, in turn, highly recommend them. -Michael O.
I recently moved to Midland and needed an oil change on my 24-year-old car. The fellas at All A’s were quick, courteous, and very skilled. We have since brought the car back for some other repairs, and they have always been professional, friendly, very reasonably priced, and accommodating. I would highly recommend them for any auto repair and/or maintenance work you need to have performed. -Joyce S.
All A’s staff was very courteous and competent. They quickly diagnosed the problem and fixed it. It was done before the promised time. I asked them to check something I suspected might also be a problem and they determined that it was not a problem that needed fixing. So I trust their integrity too. 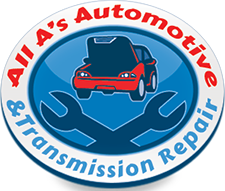 -James M.
They came highly recommended, and I know others have received great service there, but I got my transmission repaired and had to go back 4 times to get it fixed again within the first month. But they did cover all the additional visits under the warranty. Great customer service, they were very apologetic. -Dennis D.
Great place to take your car, they have an excellent customer service, everybody is super friendly. They are honest and explain everything really clear. I recommend this place 100% Thank you guys for making this experience very pleasant and for making my car safe for my road trip to Wa. -Odeth D.
This is such a great place to bring your vehicle such nice people always make you feel comfortable always explain things clearly even offers a shuttle to and from your vehicle i will never take my car anywhere else. I always leave satisfied. -Reva S.
Ron came out to where our van was broke down, towed it back to his shop and fixed it all in less than 3 hours!!! Great service and very timely!!!!! -Sarah B.